What makes a melody sound reverent? There's something special about Hymn #23. There's an inherent reverence baked into the melody and accompanying harmony. What is that? How can the same chords as almost every simple hymn be used differently to give off that sense of reverence? I have some ideas. There are subtle differences, little adjustments, small turns of phrase that play with our emotions just differently enough to bring about these feelings. More in a second. Evan Stephens adapted a song called "Our Loving Savior Dear", by Henry Tuckett, when he composed a special girls trio. The occasion was the 90th birthday of President Wilford Woodruff in 1897. This original trio version found its way into the LDS hymnal. In 1980, at a special General Conference which celebrated the 150th anniversary of the founding of the Church, the 4-part congregational setting of this hymn was first prepared and performed. It was arranged by Darwin Wolford, the same composer we discussed yesterday. The Mormon Youth Chorus sang this new version of the hymn during the Sunday afternoon session of Conference via satellite from Fayette New York. (Our Latter-Day Hymns, pg. 51). Again, with a hymn that refers to our latter-day prophets, we get, not a beatification of the prophet, but an expression of prayer. We feel a reverence for these men who dedicate the remainder of their lives to service. We pray for them, that God will sustain their amazing efforts as they work as his full-time undershepherds to build the Kingdom of God on earth. It encapsulates the reverence we feel when, for example, the prophet enters the Conference Center before a session of conference and the 21,000 in attendance all stand and become very quiet. The collective reverence demonstrates something like a silent vote of sustaining. It's very moving. So, how can a simple set of notes and chord portray these feelings? The harmonies are super simple. Lots of 1 chords and 5 chords. A few 4 chords here and there add some color. There's a 5 of 5 chord on "comfort and cheer," tonicizing the 5 chord briefly. Very common practice. And then at the very end, we get a short pause on a 6 chord followed by an inverted 2 chord going to a 5 chord and the final 1 chord. 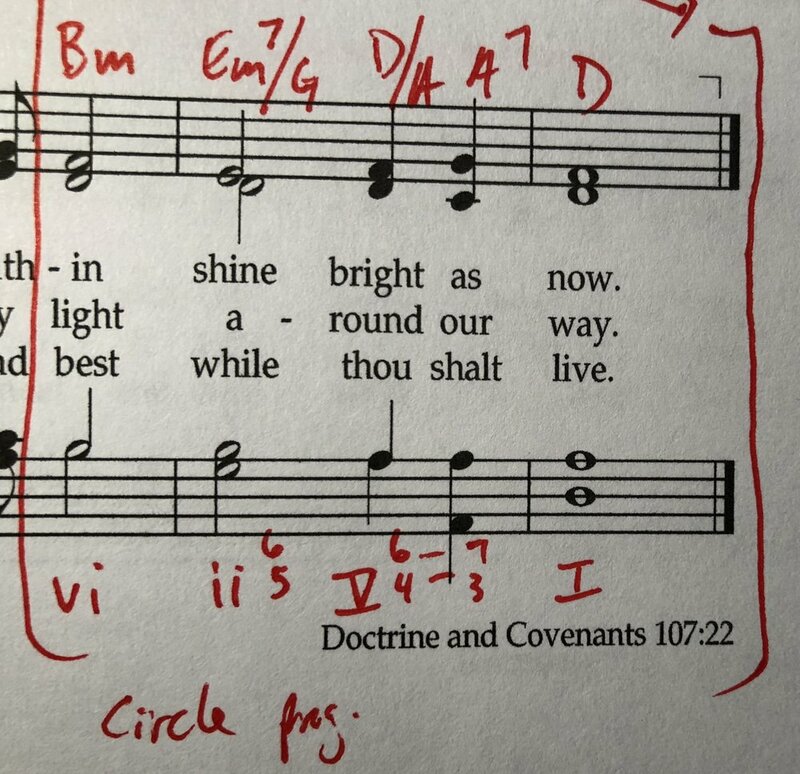 This is what we call a circle progression because the chords go right around the circle of 5th. 6-2-5-1. Super duper standard harmony. But the way Evan Stephens moves between harmonies does, I think, have something to do with the reverent feel of this hymn. And the melody, though it is also very standard, there is one aspect of its motion that brings that reverent pondering feeling. First, let's look at the motion between the harmonies. As you play through the hymn, notice how Stephens often holds the same chord while some of the voices move around within it. Sometimes the motion is between notes that belong to the chord, like the first example pictured here, or, they move between the chord, like the second example. See in the second example how the G and E on the word "for" do not belong to the D chord being played? The G is passing between the A and F#. That's what we call a "passing tone." The E is coming from a D and going back to a D. This is what we call a "neighbor tone." He uses "passing tones" and "neighbor tones" again and again throughout the hymn. They give off a slight harmonic tingling, a lovely dissonance that resolves right away. It's like a gentle rocking of the harmonic colors. Every single phrase has at least 1 of these "passing tone" or "neighbor tone" or "inner motion on the same chord" devices. This is the first subtlety that makes the music give off this sense of reverence. My favorite one is at the of the 3rd line of music. Instead of holding the bass notes steady while the upper voices move gently between one another, he flips it upside down. The melody is held steady on an A, 3 A's in a row. The bass steps down, F#-E-D. Passing tone. The tenor steps up, A-B-C#-D. 2 passing tones. The alto leaps up from D to G and then steps down to F#. But because the soprano started on A, we hear the alto as if it's a surrogate soprano voice stepping down, A-G-F#. All that lovely passing motion against the steady soprano. So nice. Now, let's look at how the melody helps out the reverent feelings. This is more subtle than the inner motion of the harmony. Deciding which notes are the important notes in a melody gives it a certain flavor. In this case, there is quite a lot of repetition of specific notes within a phrase. Of course, the first 4 notes are the most obvious repetition, but I'm not referring to those notes; though, they do get the sense of repetition started for us. Look at the words "thee" and "dear" in the 1st phrase. They are both made "important" because the composer pauses on them. The first is the halfway point of the phrase. The 2nd is the final note of the phrase. And, they are both the same note. And, neither of them is Do, they are both Mi, the 3rd scale degree. A double pause on Mi has a certain soft flavor to it. In the next phrase, there is another double pause. It's slightly different in timing and this time we pause on Re, the 2nd scale degree. This makes sense because Re is part of the 5 chord and we're cadencing on a 5 chord here. Phrase 3 also has a double pause, this time on the words "years" and the 2nd half of "brow" we pause on A. Phrase 4 has that unique flipping of the steady bass harmony into the soprano. But it has a melodic function too. It's yet another repeated note made important by a pause. The final phrase, Phrase 5, has the same double pause as Phrase 1 on Mi, the 3rd scale degree. Somehow when the 2 subtle elements are combined--the motion between the harmonies and the important repeated melody notes--it makes a sensitive, respectful, reverent kind of sound and feeling. One that feels good to me. I like it very much. So, does this hymn make the cut? I think so. I'm not sure we really need the original 3-part version in the back of the book, Hymn #312, though, I'd love to hear that performed sometime. As for an example of writing, I think it's an excellent one. It's important to fill your toolbox with many different tools and tricks. In this hymn, we've definitely spotted some new ways to use simple harmonies and melodies to create something unique and special. Tomorrow we'll see how a hymn with almost the same feeling of reverence achieved these feeling with some of the same techniques and a few additional strategies. P.S. If you haven't already, feel free to subscribe so you won't miss any posts. Just click the button below and tell me a bit about yourself. This hymn is interesting to me, as it would seem most appropriate to sing in the presence of the prophet, but still is effective congregationally as we do frequently pray for our prophet. Karen Davidson writes “as a devoted Latter-day Saint, Evan Stephens was able to communicate in this beautiful hymn a feeling of reverence and love for the prophet who leads the church. The words tell of the fervent, trusting prayers that are offered up on the prophet’s behalf, and the tranquil harmonies of the musical setting enhance this prayerful mood.” I can’t say it better myself, hence the quotation. I think this tune is a perfect match to the fervency of this prayer. I love this hymn and even think that Mack Wilberg’s arrangement is as sublime and moving as this hymn itself is. This is I think now the second hymn in the book where I can get on board with the suggested tempo markings. 88 even feels a titch fast for me, but I would keep it in mind based on the congregation and acoustics (ha!) of the room. My heart wants to take it about 76, but I think 80 might be just about right for singing. I would use registration that would aid in a fervent, reverential affect, using 8’s and only maybe a 4’ flute, depending on if the organ needed a little more height. Don’t be afraid of a subtle 32’ if you have one, even on more subdued hymns! Older PostFinding an error in your teacher's work...what to do?